Tentative dates: June 20 – July 4, 2018. Most people think of national parks as a place you drive through on a family vacation. But the large parks are also important environmental resources, providing refuges for wildlife species in more-or-less intact ecosystems. They are also carbon sinks that play a role in reducing atmospheric carbon and resulting climate change. And, of course, they are popular tourist destinations. 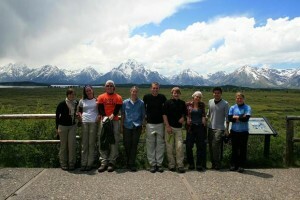 This two-week program uses the Greater Yellowstone Area as our classroom to explore how people relate to nature. This means understanding how natural systems work, and how people make decisions about the natural worlds – that’s politics. It’s relevant to sustainability questions from natural resources to engineering, to environmental journalism or history, to the study of recreation and tourism, and of course political science and other social sciences. The field experience also delivers nonacademic goals. You’ll be part of a small group exploring a natural landscape, bonding around the campfire, and developing new outdoor skills. Many students report that it’s a transformational experience in their college career. 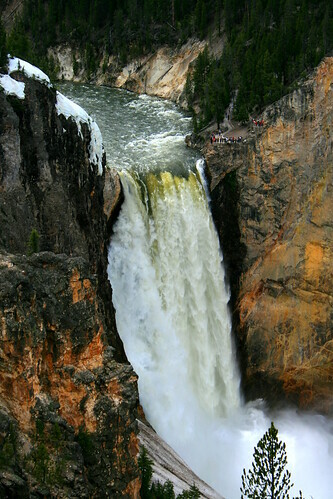 The Greater Yellowstone Area straddles Wyoming, Montana, and Idaho. It consists of three national parks, six national forests, three national wildlife refuges, a national fish hatchery, the Wind River Indian Reservation, and other state and local preserved areas. 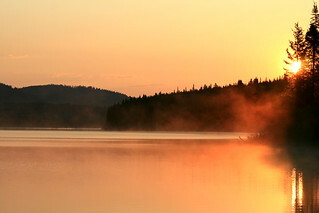 It is the largest intact temperate-zone ecosystem in the world. It faces challenges from extractive resource development, tourism, and climate change. 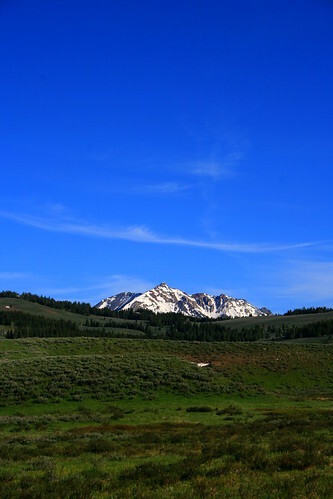 This course uses a week-long trip to the Greater Yellowstone Area to explore political questions associated with natural resources and the environment. The course is open to anyone interested in receiving college credit for this kind of experience. It is possible for non-degree students and students from other universities to enroll; please inquire with Professor Pahre. It counts as Gen Ed credit (Social and Behavioral Sciences: Social Science) for Illinois students. We can work with K-12 teachers who think it may provide credits for professional education. State standards are here. To join the mailing list, email pahre@illinois.edu. This is a great way to stay informed before submitting an application. Applications now accepted on first-come, first-serve basis. Act as tourists. 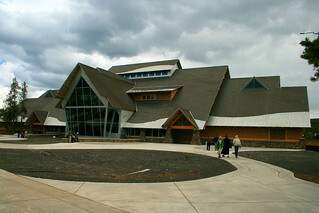 We will experience the tourist infrastructure of the Yellowstone Area and think critically about the costs and benefits of hotels, campgrounds, visitor centers, restaurants gas stations, campgrounds, parking lots, grocery stores, gift shops, and everything else that the parks have built to serve tourists. We’ll discuss alternatives to the status quo from a range of perspectives, imagining more or less development, a greater or lesser role for private enterprise, and the possibilities for different kinds of recreation in the national parks. We’ll also talk about the tourist experience in the gateway communities outside the national parks, such as Jackson (WY), Gardiner (MT) and West Yellowstone (MT). Engage “wilderness.” We will spend a fair amount of our time hiking. This will include highly-developed front-country trails and boardwalks as well as primitive backcountry trails. We’ll talk about wilderness values and how people do or do not experience places as “wilderness.” We’ll think about whether wilderness is important to us or to other people, and how demographic changes affect Americans’ views of wilderness. We’ll discuss how the national forests and national parks think about wilderness and how they manage areas designated, zoned, or proposed as wilderness under the Wilderness Act of 1964. Discuss wildlife management. Generally speaking, we discuss the politics of each wildlife species whenever we see it, so wildlife viewing plays an important role in the course. Yellowstone’s wildlife is world-famous and attracts a lot of political attention. 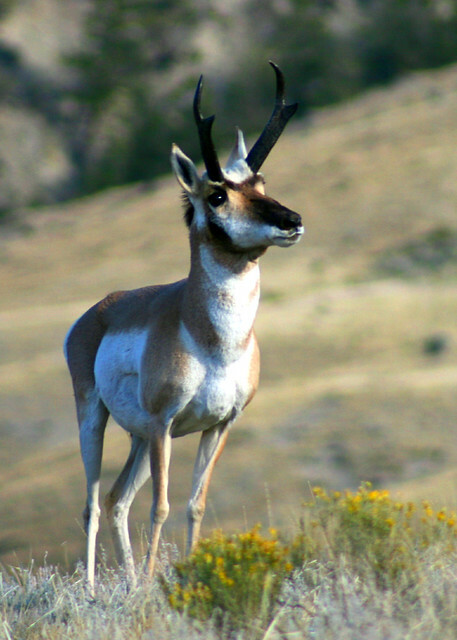 We’ll discuss the politics of wolves, grizzly bears, bison, deer and elk, pronghorn antelope, white pelicans, coyotes, and several species of trout. 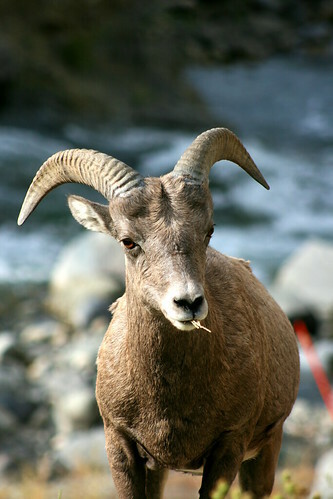 We’ll also discuss management challenges concerning less politicized species such as bighorn sheep, moose, mountain goats, pikas and trumpeter swans. We’ll also talk about how the management of politicized species affects other species such as beaver or songbirds. 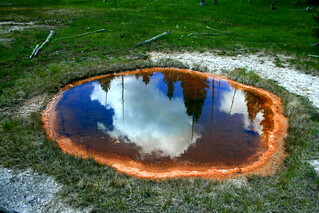 Experience Yellowstone’s stories. 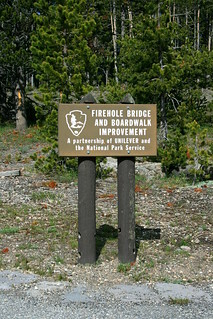 The National Park Service gives a lot of attention to “interpretation,” telling the human and natural stories of the Yellowstone region. We’ll see the stories it tells, think about how it tells them, and ask whether it leaves out important stories that should be told. 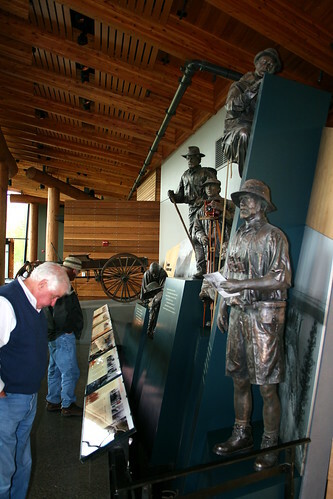 We’ll compare the Park Service stories to those stories in other museums and visitor centers in the region, both public and private. Learn about other management issues. We’ll learn about wildfire policy in both national forests and national parks, the challenges posed by non-native species, how climate change affects the Greater Yellowstone region. We’ll think about how development outside the parks affects the parks. 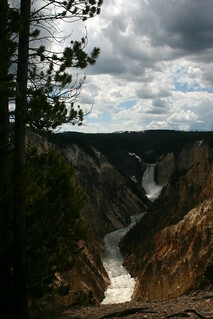 We’ll discuss the role of private businesses in the Greater Yellowstone, both inside and outside the park. Learn about stakeholders. We’ll meet some stakeholders and talk about others. These include American Indians in the region, gateway communities and businesses, environmentalists, tourists, hunters and anglers, and YOU! If you’re curious what kinds of political issues occur around a national park, here is an article by Pahre that discusses a big debate twenty years ago. 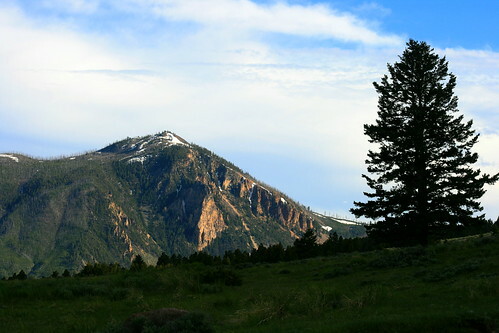 Bunsen Peak. Sometimes we climb it, sometimes we view it from the Beaver Ponds trail. Target audiences: We’ve had mostly college students and some advanced high school students. This is an introductory course without prerequisites. It’s taught at a level appropriate for students at a major public research university. Please email me at pahre@illinois.edu if you would like to discuss whether this level is appropriate for you. Students in the Division of General Studies will appreciate earning Gen Ed credit while using a multidisciplinary approach to studying human relationships with the environment. We’ve also had a few master’s students who took this as an independent study course. This entails a focused reading list around your interests, some seminar-like papers, and a research project appropriate to your field. Contact pahre@illinois.edu to discuss your options. 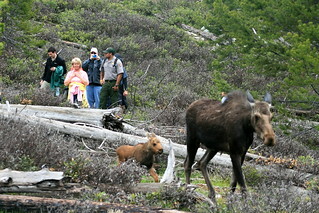 Moose Viewing in the Tetons. If you’re a student at the University of Illinois, the course material will be most relevant for students are majoring in (1) Political Science; (2) Earth, Society, and the Environment; (3) Journalism; (4) Recreation, Sport and Tourism; and (5) Natural Resources and Environmental Studies. However, anyone is welcome. We have had students in Industrial Design, English, Painting, Psychology and other majors participate. We can modify some assignments around your interests. We have had some incoming freshmen at Illinois take this course in the past. This requires some additional paperwork, so please contact me as soon as possible to get that started. 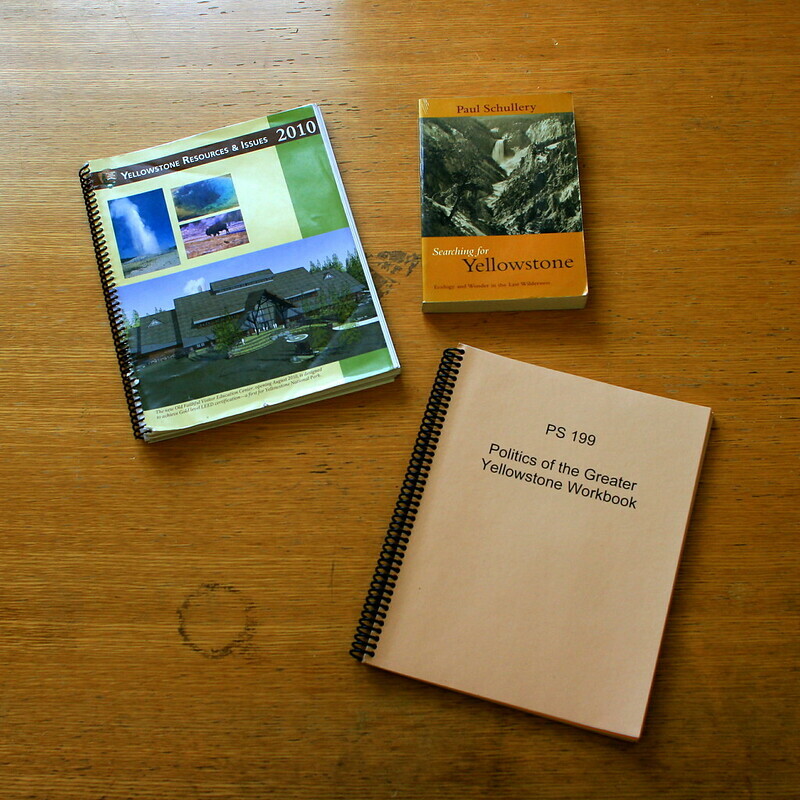 Teachers will find material useful for courses in environmental education, history, and social sciences. We will use NPS lesson plans as appropriate for the mix of people who enroll in the course. International students will find this experience a great introduction to the American West and its distinctive regional culture. We have found that international perspectives on the natural world differ considerably from American views, and make for great discussions. Desired outcomes: You will develop a greater understanding of the environmental values served by public and private lands in the Greater Yellowstone Area. You will learn to see the landscape critically, identifying challenges to management and failures of management. You’ll gain empathy for stakeholders on all sides of political issues. You’ll experience personal growth and other nonacademic development. Experiential learning emphasizes the interplay between general ideas and a specific place. Focus on this particular region will deepen your understanding of the political environment and the challenges faced when managing any environmental problem. Knowing one place better helps you transfer ideas to other places, wherever you end up living and working. Nuts and bolts. Students will receive three credit hours for this course at the 200 level. If you require credit at the 400 level or 500 level, please contact me at pahre@illinois.edu as soon as possible to discuss your options. Though it is not required, PS 225 (Environmental Politics) provides helpful background. It is offered as a traditional lecture course each fall semester. We usually offer an online version in the second eight weeks of each Spring semester, and another online version in Summer Session I or II. PS 224 and PS 225 complement each other well but PS 225 is not required. While anyone can apply, PS 224 will give priority to Illinois students and alumni, and to students at CIC (Big 10) and Illinois colleges and universities. International students at Illinois will need a visa extension, which has not posed problems in the past. Contact Professor Pahre with questions. In addition to summer tuition (see here), participants must pay a program fee of $800 that includes local transportation, lodging, and most meals. It assumes tent camping to save costs. The course van departs from Champaign but we can pick people up along the way along I-74 in Illinois and I-80 in Iowa and Nebraska. If you are interested in earning more academic credit this summer, contact Professor Pahre about doing an independent study course associated with this field experience. We can also design a project appropriate for ESE capstone projects and Political Science honors theses. Financial Aid is available if you take six credit hours in Summer Session II. Some people have taken both PS 224 and an independent study course with Pahre to reach six credits and receive financial aid. For more information about the course and logistical matters, look at the FAQ or email Professor Pahre (pahre@illinois.edu). People always ask about what wildlife we’ll see, so I’ve compiled information about past years and my best guesses for the future. Health and fitness. We can accommodate some physical limitations, and we have adjusted itineraries each year as we learn about the group’s interests and fitness. We have sometimes divided into two groups for people with higher or lower goals for physical challenge. Then we come together to discuss our different experiences. The bulk of the group is typically comfortable walking 3-5 miles at a time (2-3 hours). Longer outings include options for people to hang out at a scenic spot and wait for others to return. 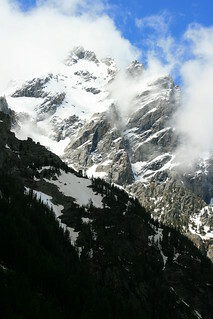 Most campsites are at elevations of 5000-7000 feet. This increases exertion levels a bit, though you’ll acclimate fully in a couple of days. The elevation can make asthma worse, so bring your inhaler or medications. Contact Pahre if you have any questions about physical limitations. Applications to participate are available from Pahre at pahre@illinois.edu or here. We will have a priority deadline of March 28, 2016. Depending on space and other logistical issues, there will probably also be a non-priority deadline in April. In that later period, we will admit students on a first-come, space available basis. Professor Robert Pahre is a Professor of Political Science, and has a courtesy appointment as Professor in Recreation, Sport, and Tourism. 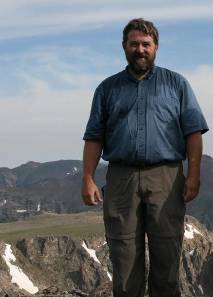 This will be the sixth time Professor Robert Pahre has led a class to the Greater Yellowstone Area. He has also taken students to Mammoth Cave National Park three times, once to Great Smoky Mountains National Park, twice to Indiana Dunes National Lakeshore, once to Colorado and Utah. He has also taught month-long summer courses in Austria for summer courses on three occasions. As you can tell, he is a believer in experiential learning programs. These experiential courses have been recognized with departmental, college, and campus teaching awards. Pahre is an avid hiker and backpacker, and he is trying to be a better photographer. 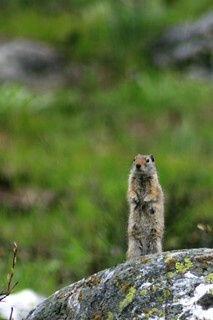 Check out his national parks photos on Flickr if you like. He has been to Yellowstone about a dozen times, and written on the area in both scholarly and popular outlets. See his research page for more information. 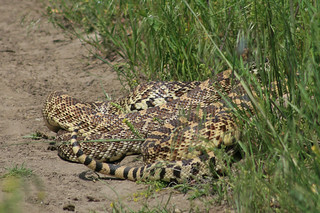 Professor Pahre’s current research and teaching concerns environmental politics, especially the politics of wildlife and wilderness. He is interested in the management of public lands, transboundary cooperation on environmental problems, and how the National Park Service tells the stories of American history. You can read about the 2009 course in LAS News and a related article here, in the Political Science Alumni Newsletter, and the Daily Illini (by Kelsey Caetano-Anolles). You can read about the 2010 course in an article by Ruth Johnson in the Political Science Alumni Newsletter. You can also read my reaction to Ken Burns’ film on the national parks here.